SALT LAKE CITY – With the chill of winter comes a spike in community-acquired pneumonia (CAP), which spreads more easily as people retreat indoors and come into close contact. The lung infection triggers persistent coughing, chest pain, fever, and difficulty breathing, and is particularly hard on the very young and the very old. In fact, pneumonia is the leading cause of hospitalization among U.S. children, with estimated medical costs of $1 billion annually. “Over the last three decades, introduction of Haemophilus influenzae type b and pneumococcal conjugate vaccines has significantly lowered the incidence of bacterial pneumonia in children,” says co-investigator Andrew Pavia, M.D., chief of the division of pediatric infectious diseases at University of Utah School of Medicine. “Our results are consistent with previous findings, and support continuing immunization efforts to maintain the reduction in bacterial pneumonia. To address this need, 2,638 children with pneumonia symptoms were enrolled in the study between July 2010 and June 2012 at three hospitals: Primary Children’s Hospital in Salt Lake City, Le Bonheur Children’s Hospital in Memphis, and Monroe Carell Jr. Children’s Hospital in Nashville. Of the 2,222 whose chest X-rays confirmed the diagnosis, their body fluid samples were assayed for bacterial and viral pathogens. Children with recent hospitalization or severe immunosuppression were excluded. 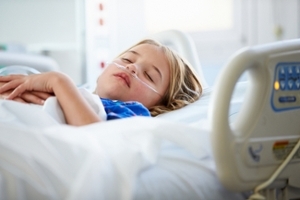 More than a dozen bacterial and viral pathogens were found in children of all ages, 21 percent of whom required intensive care. RSV was found the most frequently, and was more common in children under age 5 than in older children (37 vs. 8 percent), as was adenovirus (15 vs. 3 percent) and human metapneumovirus (15 vs. 8 percent). In children between ages 5 and 18, the most common pathogen was the bacteria Mycoplasma pneumonia, which was detected more frequently than in younger children (19 vs. 3 percent). Half of the children hospitalized with pneumonia were age 2 or younger, demonstrating that the very youngest carry the largest burden. “The results help define the role of viruses as major players in pediatric pneumonia and shows a need for new therapies that can reduce the severity of viral pneumonia,” says Chris Stockmann, co-investigator and senior research analyst at the University of Utah. The second most commonly detected pathogen among children with pneumonia was rhinovirus, the predominant cause of the common cold. Interestingly, the pathogen was also found in a large percentage of matched “controls” who had no symptoms (22 percent with pneumonia vs. 17 percent without). One interpretation is that rhinovirus infections do not commonly lead to pneumonia. Another is that some types of rhinoviruses cause a runny nose while others cause severe pneumonia that leads to hospitalization. Pavia cautions that because samples came from just three hospitals, reported trends may not accurately reflect the U.S. population. Further, rates of bacterial infection may be underrepresented since bacterial diagnostic tests are less sensitive than those for viruses. The latter may partially explain why no pathogens were detected in 19 percent of children diagnosed with pneumonia. This work was carried out by investigators at University of Utah Health Sciences, the Centers for Disease Control and Prevention, Vanderbilt University School of Medicine, Le Bonheur Children’s Hospital, University of Tennessee Health Science Center, Northwestern University Feinberg School of Medicine, and St. Jude Children’s Research Hospital, and was supported by the Centers for Disease Control and Prevention.